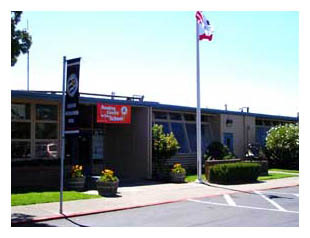 Windsor Creek Elementary School, home to 500 second and third grade students, is located adjacent to the 4 ½ acre Windsor Town Green. Our campus is nestled between the Windsor Creek, home to blue and valley oaks some of which are over 200 years old, and new residential neighborhoods bustling with children and young families.We are extremely proud of our efforts to provide our students with both an exemplary academic program and a safe and nurturing environment, where their uniqueness and differences are truly respected. Parents are such a vital component to our school community that we provide volunteers with a volunteer coordinator. We provide students with quality enrichment programs in physical education, library, and computers. Our students have butterfly and nectar gardens, and a greenhouse in which to conduct observations and experiments. We celebrate our students achievements at monthly award assemblies designed to encourage, motivate, and recognize their efforts. Our highly trained and skilled staff is committed to supporting our students in reaching their full potential, both academically and socially. Stop by and visit our campus, we are certain you’ll catch our Wolf Cub Pride! Windsor Creek’s school community continually strives for excellence. In both 2010 and 2004, we received the distinction of being named a California Distinguished School. We are extremely proud of our rigorous academic programs utilizing the most up to date textbooks, meeting both district and state standards. We are home to approximately 400 second and third grade students. This unique configuration allows our entire school and staff to focus primarily on these two grade levels. We believe that this design helps us best meet our goal of doing an exceptional job preparing our students for the next grade level with the highest academic expectations. Our students are provided with enrichment programs in physical education, computer science, and library. We are also proud of our Butterfly and Nectar Gardens, and Greenhouse program. The Windsor Rotary provided our school with a grant to complete this unique and rewarding program for our students. With outdoor facilities available students are better able to scientifically observe, record data, predict outcomes, and make conclusions about their theories. Our computer lab provides students with an opportunity to use our iMac lab. Our Volunteer Coordinator works with over 200 volunteers training them in the use of office equipment and assisting them with classroom projects and activities. We provide our volunteers with special recognition at our annual Volunteer Ice Cream Social. Students are encouraged to participate in our Reading Counts Program where they receive recognition and rewards for their efforts in reading (Reading Counts Book List) This motivational program has been so successful that students rush to take quizzes in the computer lab and beg for higher goals! Wells Fargo Bank has been generous enough to assist our school with funding for this amazing program. Windsor Creek students read over 30,000 books annually due to this exciting program. Windsor Creek provides struggling students that qualify with numerous interventions. Our Support Programs include Resource Specialist Program, Special Day Class, English Language Development, Speech and Language, Occupational Therapy, and Adaptive PE. Our highly trained teachers also provide CLAD and SDAIE lessons and support within the classroom program. We offer students a myriad of special activities and events. Some of our Special Events include, College Tee Assembly Night, STEM night, Math Night, Arts Day, Field Day, Storytelling Nights, Book Fairs, Reading Counts Carnival, Monthly Awards Assemblies, Halloween Parade and Carnival, Third Grade Dictionary Day, Classroom Safari, Lunch with the Principal, Read Across America Day, Science Day and Student Council Spirit Days. For more information about our school and the wonderful programs we offer, please don’t hesitate to contact us.